Cancer immunotherapy is the use of the immune system to reject cancer. The main premise is stimulating the patient's immune system to attack the malignant tumor cells that are responsible for the disease. This can be either through immunization of the patient (e.g., by administering a cancer vaccine, such as Dendreon's Provenge), in which case the patient's own immune system is trained to recognize tumor cells as targets to be destroyed, or through the administration of therapeutic antibodies as drugs, in which case the patient's immune system is recruited to destroy tumor cells by the therapeutic antibodies. Cell based immunotherapy is another major entity of cancer immunotherapy. 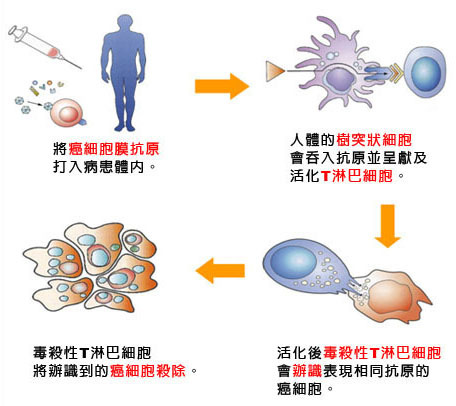 This involves immune cells such as the Natural killer Cells (NK cells), Lymphokine Activated killer cell(LAK), Cytotoxic T Lymphocytes(CTLs), Dendritic Cells (DC), etc., which are either activated in vivo by administering certain cytokines such as Interleukins or they are isolated, enriched and transfused to the patient to fight against cancer. Since the immune system responds to the environmental factors it encounters on the basis of discrimination between self and non-self, many kinds of tumor cells that arise as a result of the onset of cancer are more or less tolerated by the patient's own immune system since the tumor cells are essentially the patient's own cells that are growing, dividing and spreading without proper regulatory control. In spite of this fact, however, many kinds of tumor cells display unusual antigens that are either inappropriate for the cell type and/or its environment, or are only normally present during the organisms' development (e.g. fetal antigens). Examples of such antigens include the glycosphingolipid GD2, a disialoganglioside that is normally only expressed at a significant level on the outer surface membranes of neuronal cells, where its exposure to the immune system is limited by the blood–brain barrier. GD2 is expressed on the surfaces of a wide range of tumor cells including neuroblastoma, medulloblastomas, astrocytomas, melanomas, small-cell lung cancer, osteosarcomas and other soft tissue sarcomas. GD2 is thus a convenient tumor-specific target for immunotherapies. Other kinds of tumor cells display cell surface receptors that are rare or absent on the surfaces of healthy cells, and which are responsible for activating cellular signal transduction pathways that cause the unregulated growth and division of the tumor cell. Examples include ErbB2, a constitutively active cell surface receptor that is produced at abnormally high levels on the surface of breast cancer tumor cells. The use of some agents can lead to the re-activation of latent tuberculosis (TB) and this must be assessed for before those agents are used therapeutically. Cancer immunotherapy has arisen from advances in both oncology and immunology fields over the last few centuries. Immunotherapy began in 1796 when Edward Jenner produced the first vaccine involving immunisation with cowpox to prevent smallpox. Towards the end of the 19th century Emil von Behring and Shibasabo Kitasato discovered that injecting animals with diphtheria toxin produced blood serum with anti-toxins to it. Following this Paul Ehrlich's research gave rise to the "magic bullet" concept; using antibodies to specifically target a disease. The production of pure monoclonal antibodies for therapeutic use was not available until 1975 when Georges J. F. Köhler and Cesar Milstein produced the hybridoma technology, although it wasn't until 1997 when Rituximab, the first antibody treatment for cancer, was approved by the FDA for treatment of follicular lymphoma. Since this approval, 11 other antibodies have been approved for cancer; Trastuzumab (1998), Gemtuzumab ozogamicin (2000), Alemtuzumab (2001), Ibritumomab tiuxetan (2002), Tositumomab (2003), Cetuximab (2004), Bevacizumab (2004), Panitumumab (2006), Ofatumumab (2009), Ipilimumab (2011) and Brentuximab vedotin (2011). The production of vaccines for cancer came later than the use of monoclonal antibodies. As our understanding of human immunology has improved, so has our potential to produce effective cancer vaccines. The first cell-based immunotherapy cancer vaccine, Sipuleucel-T, was approved in 2010 for the treatment of prostate cancer. Cancer specific T-cells can be obtained by fragmentation and isolation of tumour infiltrating lymphocytes, or by genetically engineering cells from peripheral blood. The cells are activated and grown prior to transfusion into the recipient (tumour bearer). Adoptive T-cell therapy is form of passive immunization by the transfusion of T-cells, which are cells of the immune system. They are found in blood and tissue and usually activate when they find foreign pathogens. Specifically they activate when the T-cell's surface receptors encounter other cells that display small parts of foreign proteins on their surface MHC molecules, known as antigens. These can be either infected cells, or specialised immune cells known as antigen presenting cells (APCs). They are found in normal tissue and in tumor tissue, where they are known as tumor infiltrating lymphocytes (TILs). They are activated by the presence of APCs, such as dendritic cells that present tumor antigens to the T-cells. Although these cells have the capability of attacking the tumor, the environment within the tumor is highly immunosuppressive, preventing immune-mediated tumour death. There are multiple ways of producing and obtaining tumour targeted T-cells. T-cells specific to a tumor antigen can either be removed from a tumor sample (TILs) or T-cells can be removed from the blood and genetically engineered to be tumor specific. Subsequent activation and expansion of these cells is performed outside the body (ex vivo) and then they are transfused into the recipient. Although research has made major advances in this form of therapy, there is no approved adoptive T-cell therapy as yet. The tumor specific T-cells used for treatment will be specific for a particular antigen present within the tumor, or for the stroma or vasculature, which the tumor may be dependent on. Examples of T-cell targets are tissue differentiation antigens, mutant protein antigens, oncogenic viral antigens, cancer-testis antigens and vascular or stromal specific antigens. Tissue differentiation antigens are those that are specific to a certain type of tissue. T-cells specific to these antigens will target normal cells that contain these antigens as well as cancer cells (e.g. carcinoembryonic antigen; CEA). Mutant protein antigens are likely to be much more specific to cancer cells because normal cells shouldn't contain these proteins. Normal cells will display the normal protein antigen on their MHC molecules, whereas cancer cells will display the mutant version. T-cells can differentiate between these two, selectively targeting the cancer cell. Some viral proteins are implicated in forming cancer (oncogenesis), and therefore T-cells that are specific to viral antigens can be used to attack infected cells (which will include cancer cells). Cancer-testis antigens are antigens expressed primarily in the germ cells of the testes, but also in fetal ovaries and the trophoblast. Some cancer cells aberrantly express these proteins and therefore present these antigens, allowing attack by T-cells specific to these antigens. Example antigens of this type are CTAG1B and MAGEA1. Dendritic cell therapy comprises a group of methods that provoke anti-tumor responses by causing dendritic cells to present tumor antigens. Dendritic cells present antigens to lymphocytes, which activates them, priming them to kill cells which also present the antigen. They are utilised in cancer treatment to specifically target cancer antigens. This group of cell-based therapy boasts the only approved treatment for cancer, Sipuleucel-T.
One method of inducing dendritic cells to present tumor antigens is by vaccination with short peptides (small parts of protein that correspond to the protein antigens on cancer cells). These peptides on their own do not stimulate a strong immune response and may be given in combination with highly immunogenic substances known as adjuvants. This provokes a strong response to the adjuvant being used, while also producing a (sometimes) robust anti-tumor response by the immune system. Other adjuvants being used are proteins or other chemicals that attract and/or activate dendritic cells, such as granulocyte macrophage colony-stimulating factor (GM-CSF). Dendritic cells can also be activated within the body (in vivo) by making tumour cells to express (GM-CSF). This can be achieved by either genetically engineering tumor cells that produce GM-CSF or by infecting tumor cells with an oncolytic virus that expresses GM-CSF. Another strategy used in dendritic cell therapy is to remove dendritic cells from the blood of a person with cancer and activate them outside the body (ex vivo). The dendritic cells are activated in the presence of tumor antigens, which may be a single tumor specific peptide/protein or a tumor cell lysate (a solution of broken down tumor cells). These activated dendritic cells are put back into the body where they provoke an immune response to the cancer cells. Adjuvants are sometimes used systemically to increase the anti-tumor response provided by ex vivo activated dendritic cells. More modern dendritic cell therapies include the use of antibodies that bind to receptors on the surface of dendritic cells. Antigens can be added to the antibody and can induce the dendritic cells to mature and provide immunity to the tumor. Dendritic cell receptors such as TLR3, TLR7, TLR8 or CD40 have been used as targets by antibodies to produce immune responses. Sipuleucel-T (Provenge) is the first approved cancer vaccine. It was approved for treatment of asymptomatic or minimally symptomatic metastatic castrate resistant prostate cancer in 2010. The treatment consists of removal of antigen presenting cells from blood by leukapheresis, and growing them with the fusion protein P2024 made from GM-CSF and prostatic acid phosphatase (PAP). These cells are infused back into the recipient to induce an immune response against the tumor because the PAP protein is prostate specific. This process is repeated three times. Antibodies are a key component of the adaptive immune response, playing a central role in both in the recognition of foreign antigens and the stimulation of an immune response to them. It is not surprising therefore, that many immunotherapeutic approaches involve the use of antibodies. The advent of monoclonal antibody technology has made it possible to raise antibodies against specific antigens such as the unusual antigens that are presented on the surfaces of tumors. Naked monoclonal antibodies are antibodies without modification. Most of the currently used antibodies therapies fall into this category. Conjugated monoclonal antibodies are joined to another molecule, which is either toxic to cells or radioactive. The toxic chemicals are usually routinely used chemotherapy drugs but other toxins can be used. The antibody binds to specific antigens on the surface of cancer cells and directs the drug or radiation to the tumor. Radioactive compound-linked antibodies are referred to as radiolabelled. If the antibodies are labelled with chemotherapy or toxins, they are known as chemolabelled or immunotoxins, respectively. Antibodies are also referred to as murine, chimeric, humanized and human. Murine antibodies were the first type of antibody to be produced, and they carry a great risk of immune reaction by the recipient because the antibodies are from a different species. Chimeric antibodies were the first attempt to reduce the immunogenicity of these antibodies. They are murine antibodies with a specific part of the antibody replaced with the corresponding human counterpart, known as the constant region. Humanized antibodies are almost completely human; only the complementarity determining regions of the variable regions are derived from murine antibodies. Human antibodies have a completely human amino acid sequence.